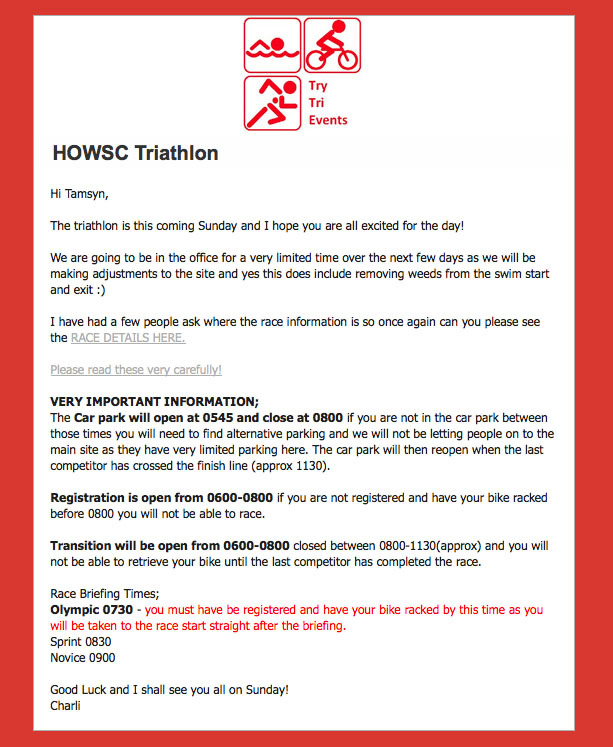 The HOWSC 100 triathlon took place today at Hampshire Open Water Sports Centre in Fordingbridge, which is about a 30-minute drive away from where I live. The entry was included as part of the triathlon training camp that Stuart and I did back in mid-June. (I don’t think I blogged about it, but it was a great weekend that was led by Ant Gritton from Run Camp and Ben Cook from Try Tri). Originally, I had intended to enter the novice event (400m swim, 10k bike and 2.5k run), but then my swimming started to improve, so I thought I should challenge myself. 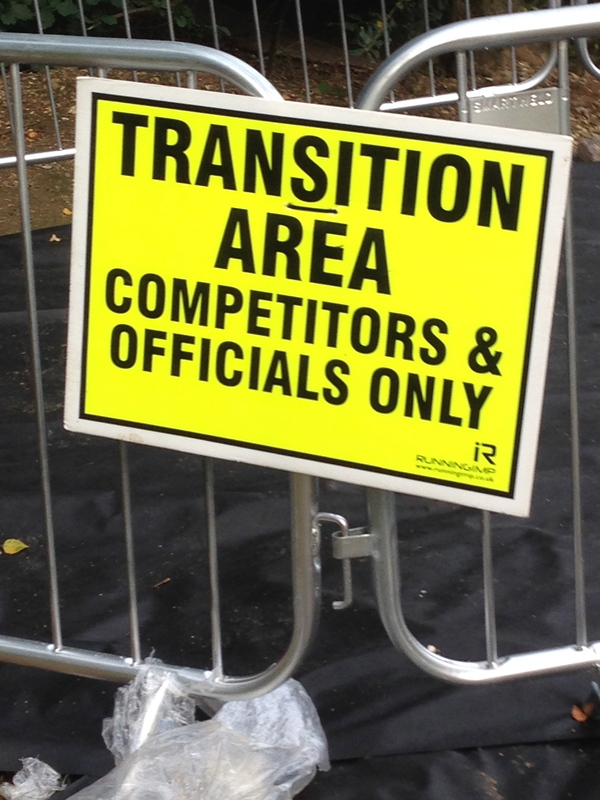 (You would think that I’d have learnt my lesson after Winchester Duathlon, but I just don’t learn!) I know I’m not fast, but I was confident that I could cycle 20k and run 5k without any extra training, which meant that only the swimming would be tough for me. I think that Stu might have been tempted by the Olympic/standard distance if it hadn’t been his first tri. Also, Stu has had some injuries recently. Yesterday afternoon, I did some organising. I always worry that I will forget something, so I have an enormous spreadsheet with loads of different sheets – each one has a packing list on it for a particular type of holiday or event. Unsurprisingly, I have one that is for a triathlon. I opened it up on my iPad and started my packing. After an hour or so of fussing around, I needed a break, so Stu suggested that we could drive down to HOWSC and register. This meant that we wouldn’t have to get up quite so early, so I agreed. We arrived at HOWSC shortly after 5pm and were surprised to find that there were half a dozen other people who were as eager to register as we were. We collected our numbers and goodie bags, with our nice silicon swimming hats in them. Stu was number 157 and I was 156. We then decided to have a walk around the lake, so that I could see where we had to enter the water and also where transition would be. (The road into HOWSC has potholes that resemble mine shafts, so I was relieved to learn that we would not be using that road at all). It was a short walk to the swim start. I was relieved to learn that we would start in the water, as I’m much happier when I’ve had a chance to acclimatise to the water. However, the steepness of the slop into the water was something that I was concerned about. I have low blood pressure (about 90/50) and often get very light-headed if I stand up quickly. 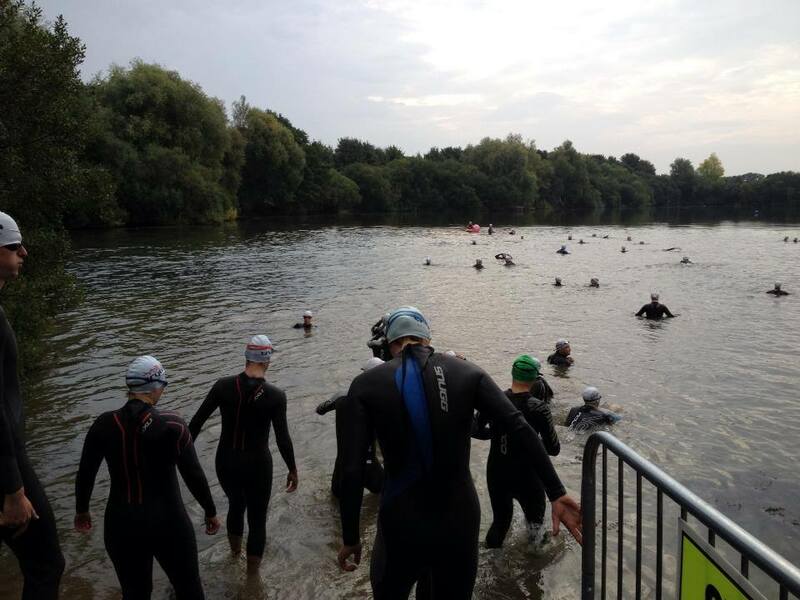 Almost every time that I’ve swum in the lake, I’ve struggled to stand up afterwards, so this was an aspect of the event that I was nervous about. 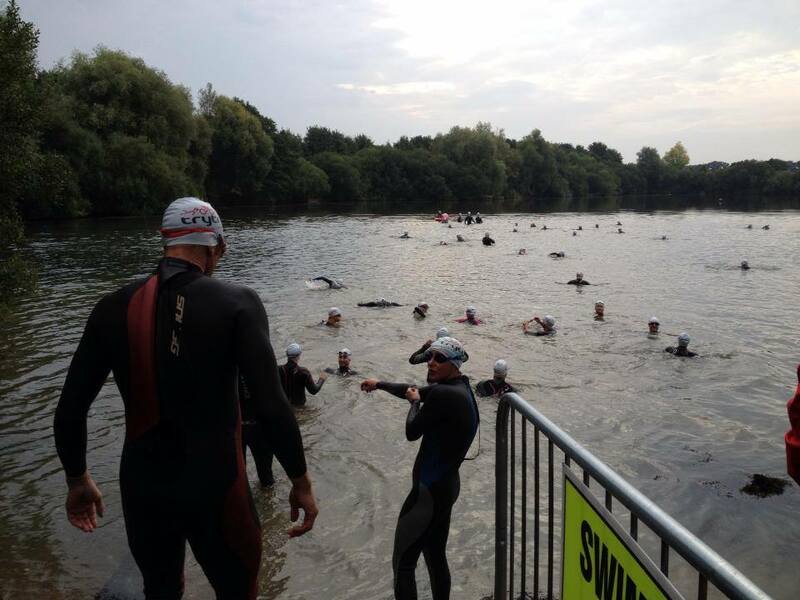 After we’d finished looking at the swim start, we decided to follow the path around to see the transition area. It was a little further away than I had expected along a muddy, pebbly path with quite a few tree roots. When we got to the transition area, we found James chatting to Ben. We asked a few basic questions and James told us that he’d already recce’d the cycle route. We’d decided that we would have a drive around it. I’d rather be prepared for steep hills as I’m still not as confident as I’d like to be. After a drive around the course, we went home and I finished organising everything. 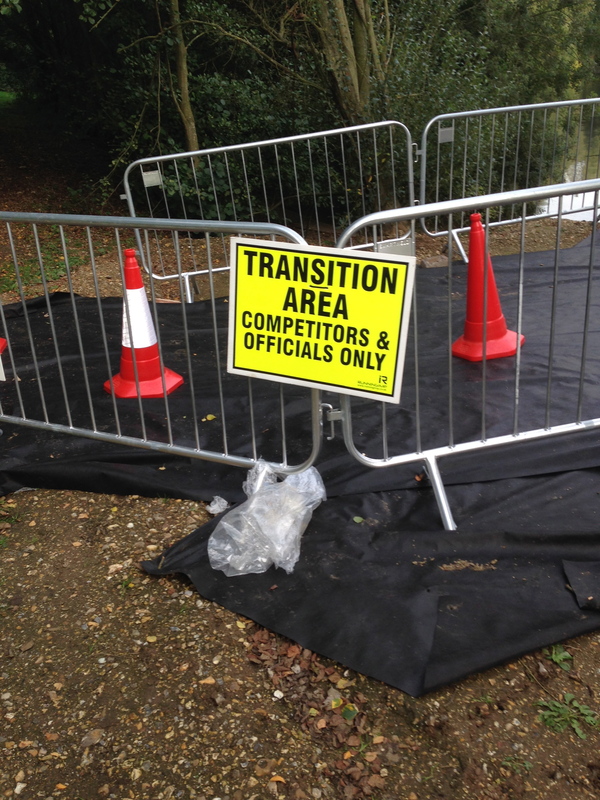 I packed clothes for almost all eventualities as I remember how cold, wet and miserable Winchester Duathlon was. I also prepared my breakfast for the morning. Porridge is my favourite breakfast, so I weighed out 30g of oats, and then decide to try something new. This isn’t usually recommended before a race, but as it wasn’t anything particularly unusual, I thought I’d be OK. I added 4 teaspoonfuls of flaxseed to my porridge to add some protein… I’ve tried flaxseed before and I like it, so I thought it would be safe. I also added a few spoonfuls of blackcurrant compote that I bought in the Polish supermarket. (I had intended for it to go into beverages at a recent cocktail night, but there was lots left over!) To round off the porridge I added a tsp. of agave nectar and some water and then put it in the fridge overnight. (This helps the oats to absorb the water, so it takes slightly less time to microwave it in the morning… it’s all about the marginal gains!) Unfortunately, this all took a while, so I didn’t get to bed until 11pm. After a slightly restless sleep, I got up at 6am. I made my porridge and then dressed in my trisuit. I also attached a plaster to me, just under where the zip of my trisuit finishes. Every time I’ve worn it under a wetsuit, it has ended up cutting my chest. I also managed to do my hair in my ‘triathlon style’ (a French plait to anyone else). This is helpful as it allows me to keep my hair tied back without it being uncomfortable under my bike helmet. After a bit of faffing around, Stu and I got our bikes onto the roof rack and at 7am we were off. We arrived at HOWSC at 7:30, which was later than most other competitors. There was still an entire section of empty rack where Stu and I were able to set up. Maybe a more experienced triathlete could advise me on where best to place my possessions. However as there was a one-way system I figured I would end up running exactly the same distance with my bike no matter where I put it. I also put a bottle of cherry Lucozade on my bike and wedged some shot bloks in the holder with it. Then I realised that my bike shoes still had their coffee shop covers on them, so I had to take them off. At that point, Teri arrived and James also came over for a chat. James had opted to wear his trail shoes for the run, which threw me into a minor panic. I had my trail shoes with me, but I’ve not worn them for a few months, so I wasn’t sure whether I should swap my shoes. Eventually, I decided to stick with my road shoes. 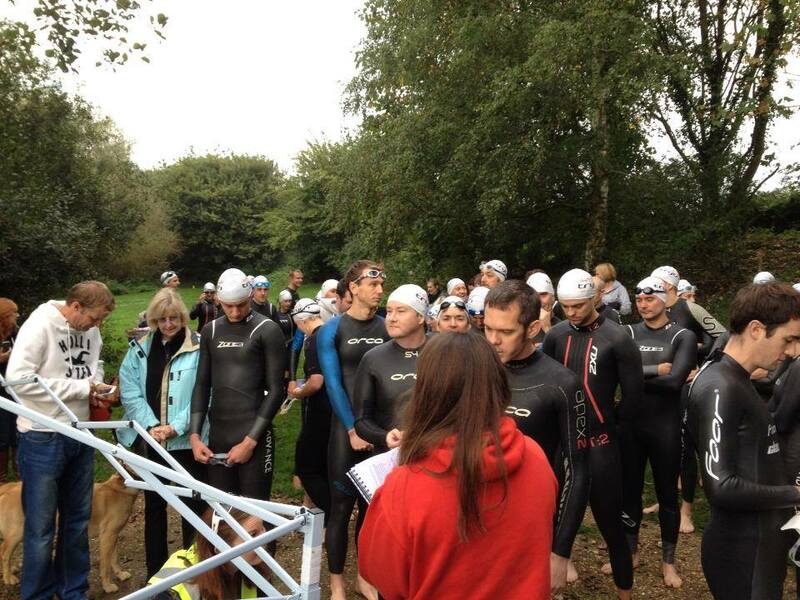 My nerves were really starting to kick in, so I popped to the loos and then put on my wetsuit. I didn’t want to have to find somewhere to leave my hoodie, so I popped that in the car boot and pulled on the sleeves of my wetsuit to keep warm. I also put on my flip-flops. James came over and let me use some of his anti-fogging spray on my goggles. 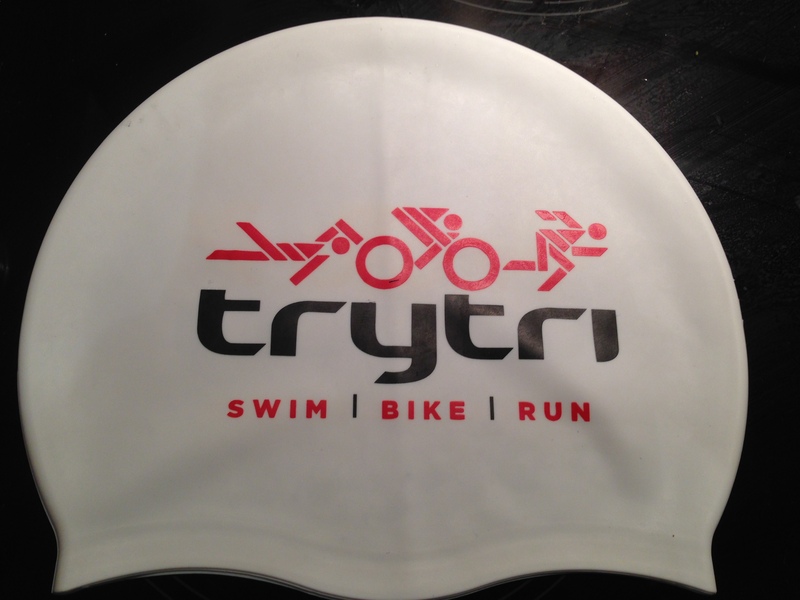 I’d not used it before but figured that if it worked for half of my swim it would be better than nothing. My last swim at Eastleigh was really difficult as there was mist hanging over the water and my goggles kept fogging up, so I couldn’t see the buoys. Then I had to make the most difficult decision for my transition – what should I do about my vision. Most people who know me are unaware of just how shortsighted I am, as I am rarely seen wearing glasses. This is not an issue of vanity, it’s just that I really do not see as well with glasses, even when they are exactly the right prescription and they do not make sports easy. Since I was thirteen years old, I’ve worn contact lenses all day every day. I’ve only ever run twice in glasses: Eastleigh aquathlon and Penzance aquathlon; I’ve only ever cycled once in glasses, which is when I had hay fever and had to wear my glasses to work. I decided to give myself some thinking time, so I placed my glasses in my goggles case on my towel, and also put my contact lens pot on a tissue on my towel. 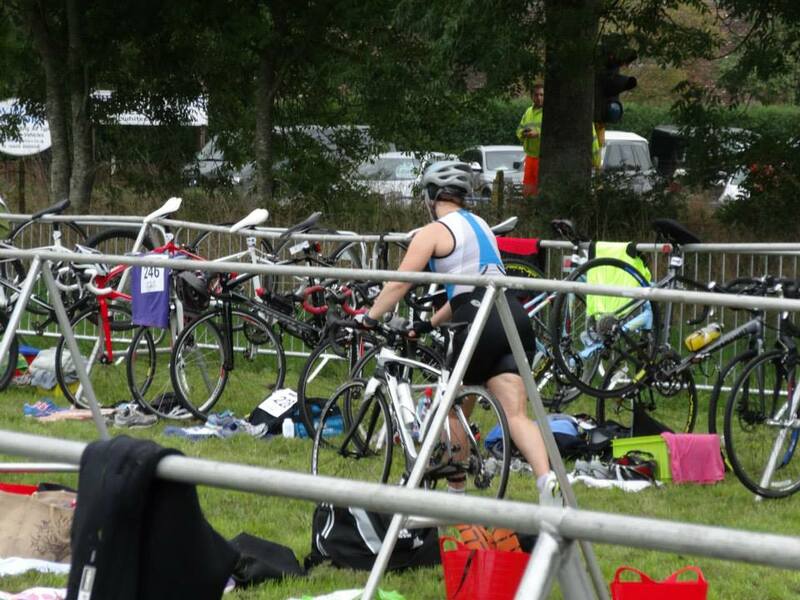 As I was leaving my usual visual aids on the towel, I had to leave the transition area with my goggles on. I felt a bit stupid, but the alternative was that Stu would have to hold my arm and guide me, whilst pointing out hazards on the floor… and I wasn’t sure that that would go well. Because of all of my faffing around, we missed the race briefing. Fortunately, James had been listening carefully. He explained that we would have to swim around the buoys until we were close to the end when we would have to swim between the buoys. I nodded and smiled hoping that the buoys (or the thrashing of the other swimmers) would be enough guidance for me. I edged my way carefully down into the lake and was pleasantly surprised by its temperature. It was not warm, but it was not nearly as cold as Eastleigh has been in the last couple of weeks. 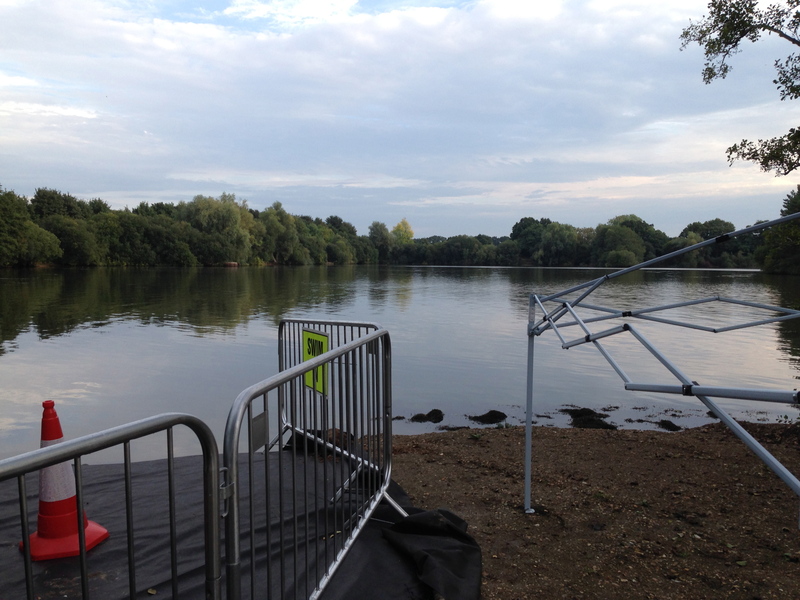 I was also expecting it to be weed-free, as I’d seen photos on Facebook of the Try Tri team weed clearing this week. However, I think they had decided to relocate all of the weeds to the lake entrance so that it would be cushioned for us all. I waded out a few more steps and then one of my feet started sinking, so I decided I’d better start swimming. After floating on my back for a bit, I turned over and put my face in the water. 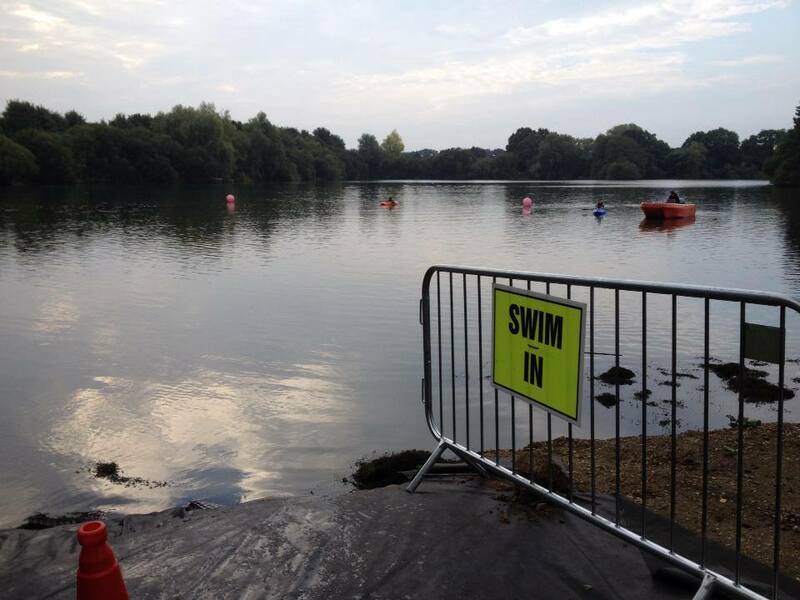 I could see where the start was, so I did a bit of breaststroke to get to the start area. Having watched the start of the standard distance triathlon, I was aware that there was a sandbank near the buoys. James was standing up with water just a bit higher than his waist and Stu had water to his chest. When I went to put my feet down I realised that I was in a much deeper area and couldn’t touch the bottom. As I wanted to adjust my goggles, I moved across. I had just finished my adjustment when I realised the countdown was taking place. People next to me were still fidgeting with their hats and goggles, but it was time to go! I was relieved that I was at the back of the pack, as I didn’t want to be caught up in the swirling water. 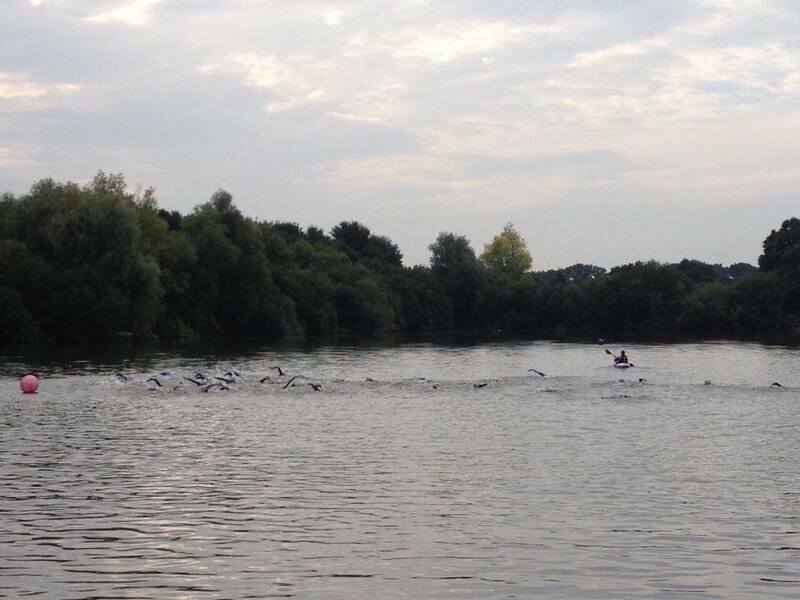 It wasn’t long before I was left trailing with just a few other swimmers around me. I just kept reminding myself to stay calm and not to try to go too fast. About halfway around, I needed to let some water out of one of my eyepieces. I paused only briefly before I continued. I wanted to know that I could do the full distance using front crawl. There were a couple of women who didn’t appear to be too far ahead. I thought there was a male swimmer behind me who was finding it difficult to sight. I didn’t want to be complacent, but I was also pleased that I might not be the last person out of the lake. Just over 20 minutes after I started, the bank was in sight. Every time I breathed, I was able to hear the spectators clapping and cheering, which spurred me on. Finally, Chris pulled me out of the lake and my swim was over. I had done it!!! (My final time was 22:19, and I was placed 44/46). I had decided to not to put on my flip-flops for the run to the transition, as I thought they might make it more difficult to run. However, as I had to keep on my goggles to see, I was unable to remove my swimming hats. I was also wary of trying to pull my wetsuit sleeves down in case they got stuck and I was unable to run properly. Unfortunately, I had not gone very far before I slipped over. It winded me and as I had to put out both of my hands, I ended up covered in mud. I was concerned that my wetsuit might be damaged but didn’t have time to stop and check. After quickly removing my wetsuit in transition, I decided that I was warm enough. I didn’t want to waste time on putting on additional clothes, with the exception of socks. I slipped them on and put on my cycling shoes. My fall meant I was covered in mud. I had decided that I would be happiest with my contact lenses in, but I was struggling to remain upright and ended up grabbing hold of the bike rack as I was so light-headed. I rubbed my hands on my towel and hoped that I wouldn’t get too much mud and pondweed in my eyes. 22 years of experience of inserting contact lenses, meant that was a fairly quick part of my transition. Finally, I put on my Garmin, gloves, headband and helmet and was ready to unrack my bike. My transition time of 3:54 meant that I was (again) one of the slowest, but there were two competitors who were slower than me! I ran towards the mount line and after going through the ditch, Ben gave me some words of encouragement and then I was out on the road. I was a little nervous that I was still a little wobbly, but once I was on my bike, I felt fine. Shortly after leaving, I realised I had forgotten my number belt and glasses. Luckily, it was not a windy day. Also, the rules had only stated that a number needed to be worn on the run. I wanted to change gear so that I could get more speed up. Unfortunately, I think my gears need reindexing, so it was not possible to get my bike into the gear I wanted. I also hadn’t set up my Garmin for cycling, so I had no idea of what speed I was cycling. Unsurprisingly, there were no cyclists in sight, so I just kept cycling. Yesterday, I had been relieved to discover there were no large hills on the cycle route, although I was mystified as to how there was a long downhill section in the second half of the ride… this dichotomy was soon clarified as I started pedalling uphill. It wasn’t long before I had turned onto a single-track country lane. I could hear a land rover behind me, but there was nowhere for me to pull over. The driver clearly wasn’t happy at having to drive at my pace. He started revving his engine at me, which made me try to pedal faster. However, there was nowhere for me to pull in. Eventually, the driver had enough and accelerated past me as fast as possible… however, the road was no wider, so he was incredibly close to me, which was a frightening experience. I just hoped that I would not encounter any more vehicles. 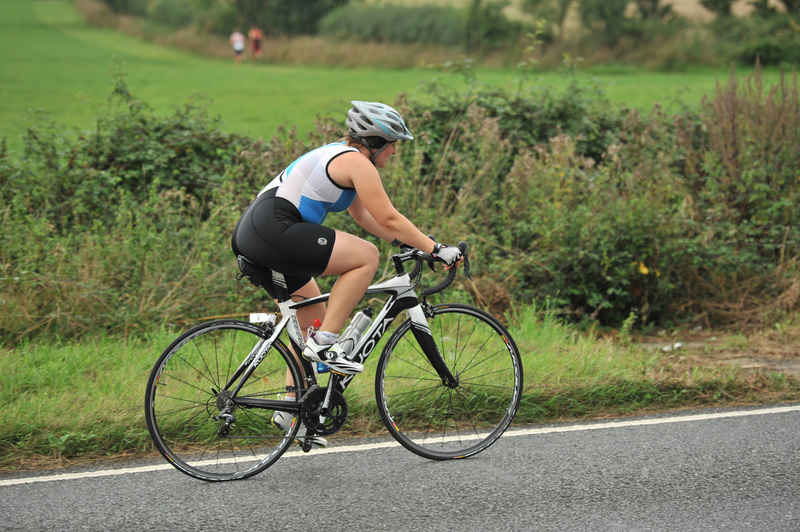 A couple of minutes later, I spied my first target… a female cyclist with a number that indicated that she was taking part in the sprint event. Having prey to stalk motivated me to redouble my efforts, so I quickly passed my fellow cyclist. I headed over the bridge and back towards the start. 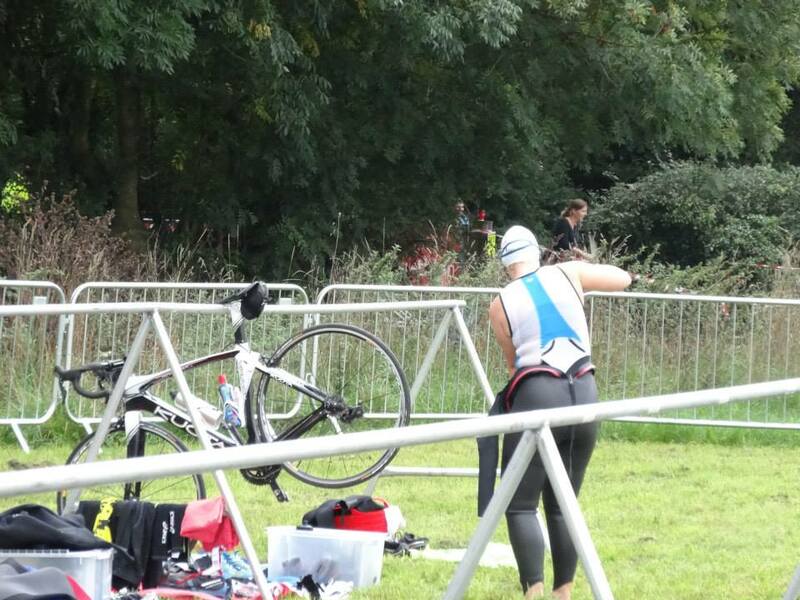 Just as I was nearing the start/finish, I saw another triathlete on the grass verge fixing a puncture. I felt sympathy for the cyclist, but couldn’t think of anything motivational to call out, so thought it best to stay silent. (After finishing, I found out that the unlucky cyclist was James). There was a long queue of traffic leading to the lights. I had to choose whether to stop, try to cycle past on the left or be brave and pass on the right. I didn’t want to waste time, so I passed on the right. This meant that I was then in the flow of the novice cyclists, which gave me lots of targets to catch. Again this was motivational, so I started pedalling harder. It wasn’t long before I got to the hill out of the village. Unfortunately, there were already some novice cyclists on the hill a young couple. The female cyclist seemed quite nervous, so her male friend was cycling next to her. This meant that cars were unable to pass, and everyone had to slow down. I ended up behind a car and had to start changing down my gears. Unfortunately, after changing gear several times, I could go no slower and then my chain came off. I felt so frustrated. If I hadn’t been stuck behind the couple, I could have powered up the hill and wouldn’t have had to put my chain back on. It didn’t take long for me to unclip my shoes, climb off and put the chain back on. Then I had to restart whilst halfway up the hill. I pedalled hard and was able to pass the cyclists who had passed whilst I was stopped. The couple was at the top of the hill, so I whizzed past them and around the corner. This time there were no vehicles and I was able to keep chasing after other cyclists. I love my beautiful bike! As I neared the end of the cycle route, I switched on my Garmin, so that I could use it for the run. I dismounted and then ran as fast as I could into the transition area with my bike. The cycle had taken me 1:01:33 and I was 34/46, which was a pleasant surprise… maybe I’m not as bad on a bike as I thought! My second transition was much less stressful than the first. I just had to take off my helmet and gloves and change shoes. However, I wasn’t as fast as I’d hoped I would be, so I was 41/46 in 1:36. I took a few swigs of cherry Lucozade, and headed out for the run. After dithering in the morning about which shoes to choose, I plumped for road shoes… but even now, I don’t know whether that was the best choice. Several runners soon passed me, but as I couldn’t see their numbers, I had no idea which distance they were doing. I could see from the stats on my Garmin that I was running much more slowly than I had hoped I would, but my legs are still a little tired from last weekend. 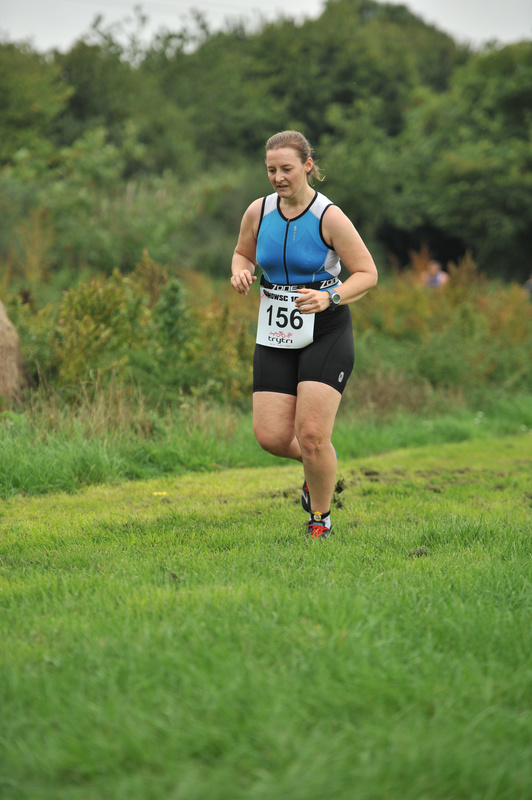 Why are my running photos always so bad? The route for the run was a little confusing. 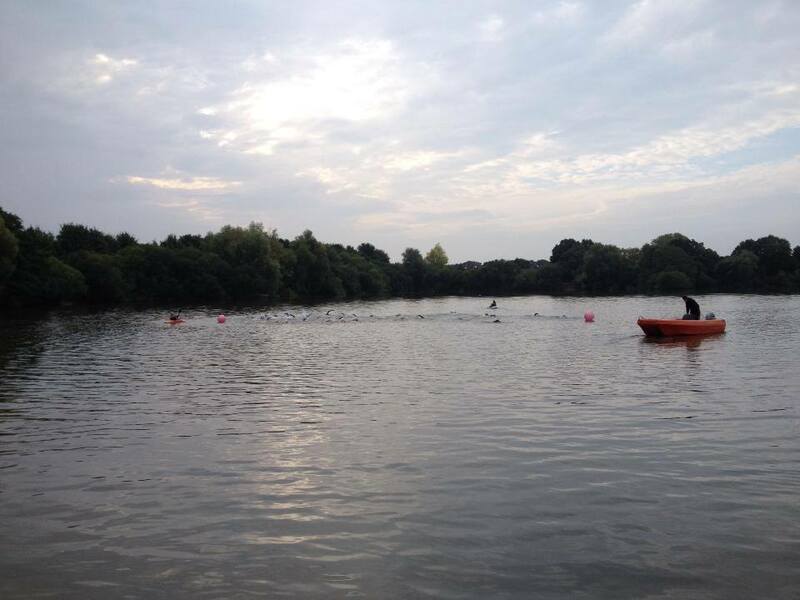 We had to run a full lap of the transition field and then a lap around the lake (passing the finish). 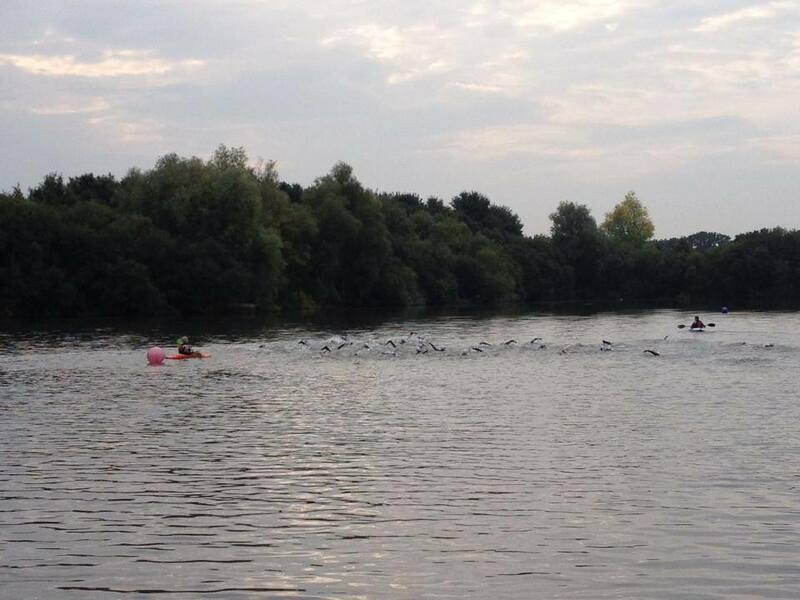 There was then another lap of the transition field, a full lap of the lake and then part of a lap to the finish. I think several athletes misjudged the laps that they had to do, and I was glad that I had my Garmin to keep me on track. On my first lap of the lake, I saw Ant and Stu (who had both finished) accompanied by Lindsey. As I was heading across the lawn, I saw Donna. She was finishing her run, whilst I still had a long way to go. I then ran past the finish gantry, where marshals were offering drinks. I would have liked some water, but at that point, they were only offering a lurid blue energy drink, so I ran on. The route was quite scenic, taking in the attractive campsite area. I arrived back at the slope to the transition area. Charli signalled the direction that I needed to go in. I could see that my pace was dropping, but my legs would not move any faster. I finished that lap and headed back on another lap around the lake. 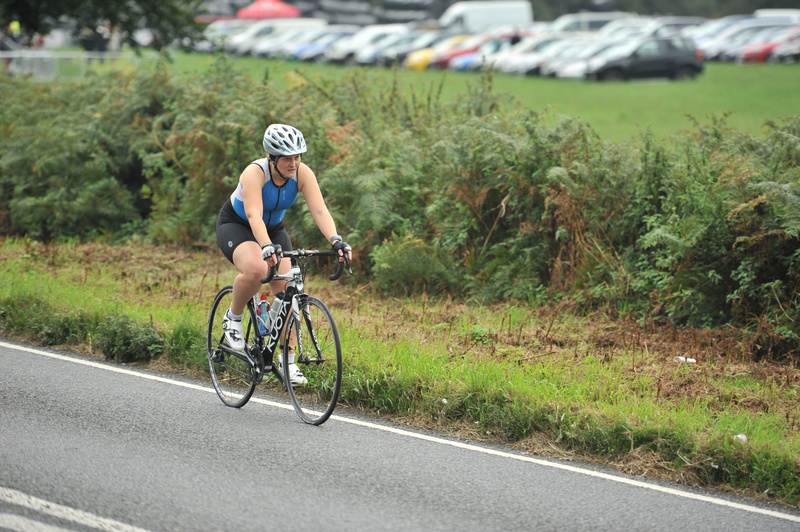 As I passed the drinks station, a bottle of water was on offer, so I gratefully took it and had a couple of swigs. This helped me to feel a bit better and I continued. About halfway around the lake, I saw a couple of women who had their numbers on their backs. I could see that they were part of my event and that they were moving more slowly than me. At last, I had a target. I kept pushing and was able to pass them. This made me feel happier as it was confirmation that I would not be the very last athlete to finish in my event. 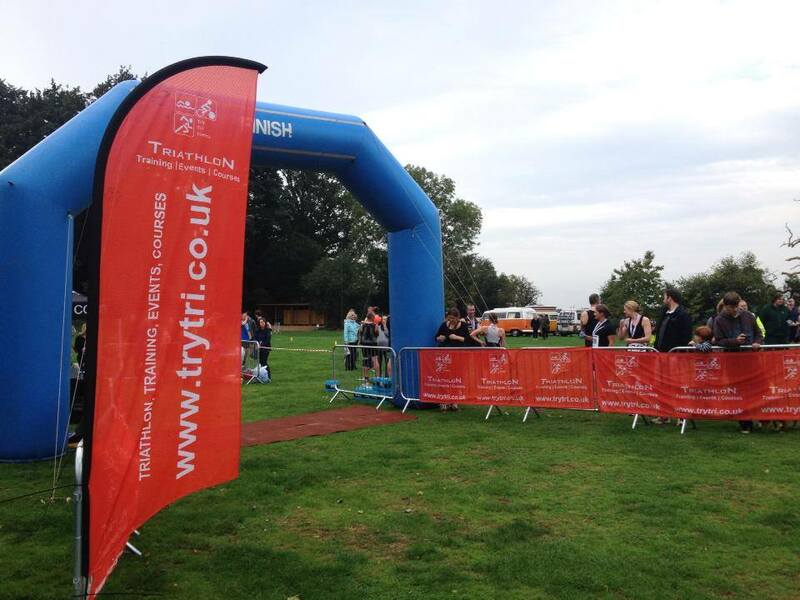 Eventually, the finish gantry was in sight. I could hear Teri, Jenny, Stu, James and Donna cheering as I neared the end. This helped me to put in a slight sprint. After I crossed the line, three young children quickly attended to me. One removed my chip, another gave me my medal and the third handed me a bottle of water. It reminded me of the scene in Cinderella where the mice and birds transform her outfit! I’m not particularly happy that my run time was 32:21 as I know that I can do significantly better than that. Amazingly, it was 34/42! 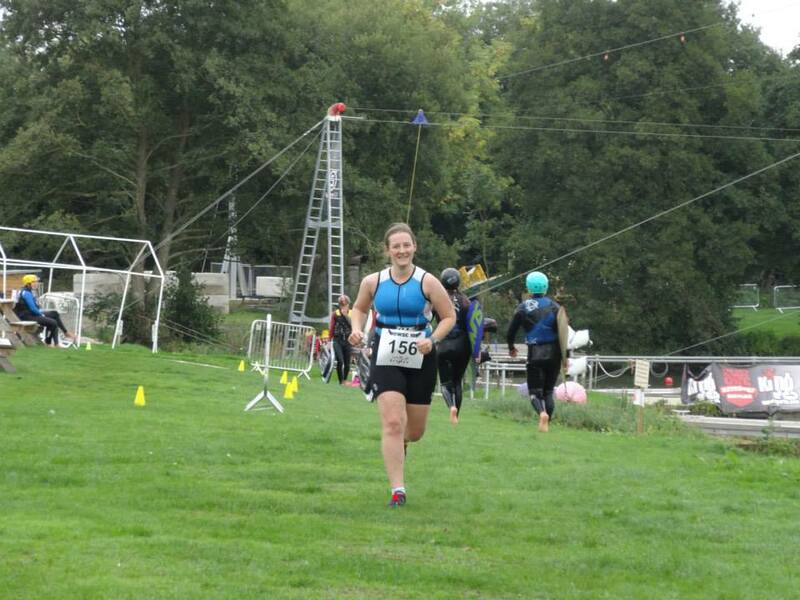 I was so pleased that I had finished and even happier that I was not crawling across the finish line after everyone else had packed up and gone home. Also, although I’m not usually too fussed about medals, I was happy that the medals we were given were particularly attractive. 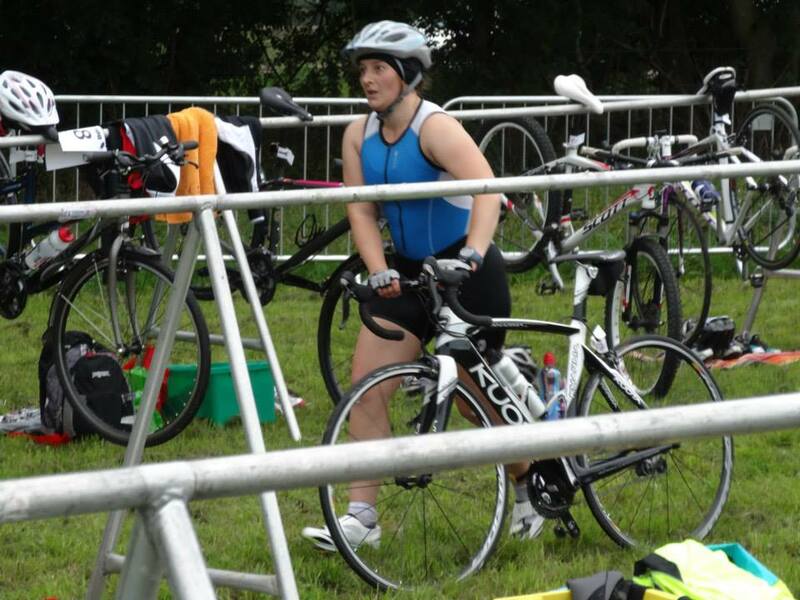 I’m now feeling much better prepared for Ferndown Try a Tri and hope that I have learnt from my mistakes. 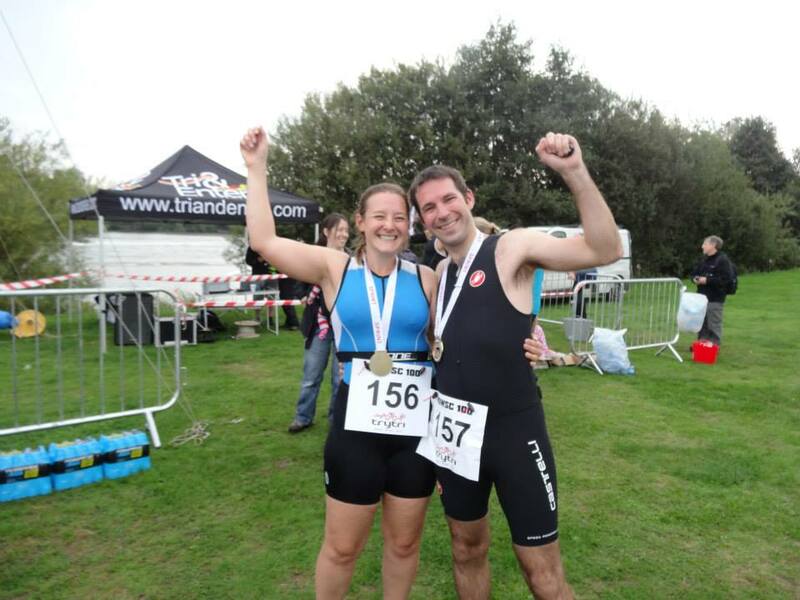 I’m looking forward to lots more Try Tri triathlons in 2014. 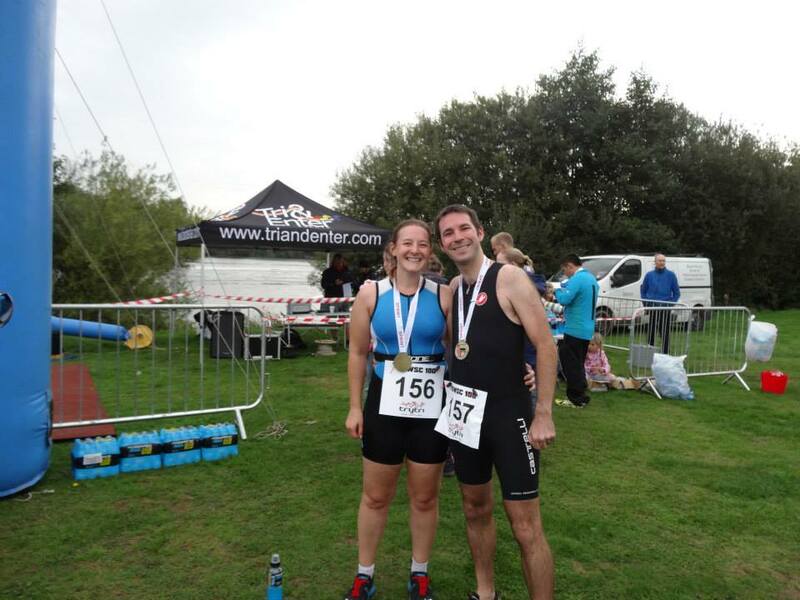 BIG CONGRATULATIONS to my wonderful husband Stu who placed sixth overall in his very first triathlon. I am so proud of him!